Jurgen Klopp is up there with the best in the business when it comes to knowing how to deal with upcoming stars. 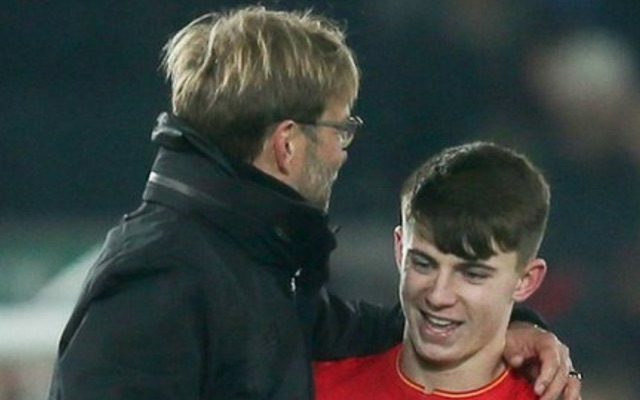 His management of the media hype surrounding Ben Woodburn has been perfect since the 17-year-old broke Michael Owen’s record to become Liverpool’s youngest ever goal-scorer. He has restored calm following the teenager’s rise to fame- something the player himself has appreciated and respected. As much as Klopp is keen to ease his young stars into first team football, he is by no means scared of giving them such an opportunity and is the ideal manager for prospects like Woodburn to develop under. He has expressed his faith in the club’s teenagers and his protection of them alone demonstrates how valuable he sees them. There is a lot of optimism surrounding the young talent Klopp has at his disposal and the potential they have under the German. We sense fans will be treated to another chance to see Woodburn get some first team action when Liverpool host Plymouth in Sunday’s FA Cup third round tie.